Living room with two sofas, ample seating and flat screen TV. Kitchen features butcher block island, new dishwasher,cook top. First Floor Master Bedroom with en suite bathroom, Jacuzzi tub. Upstairs bedroom #1 with queen bed. Upstairs Bedroom #2 with queen bed. Our airy and light-filled contemporary vacation home offers soaring ceilings and lots of windows, central A/C, and fans in all rooms. Providing 4000 sq. ft. of living space, and set in a very private, peaceful, wooded location off Lambert's Cove Road, the house is ideal for a multi-family or multi-generational holiday. Lawns, decks, hammocks, basketball court, playroom with ping pong table and toys, outdoor swing-set allow activity and relaxation for all ages. Bed linens and towels are provided. WiFi. Smart flat screen TV. Our property adjoins conservation lands, with miles of walking/biking trails to explore with ponds, meadows and woods. We have one transferable ferry ticket available for each open summer week. The first floor master bedroom suite is designed for privacy from the rest of the house. The en suite master bathroom has a Jacuzzi tub and steam shower with a separate w/c. There is also a powder room on the first floor. The living room has walls of windows and lots of casual, comfy seating. There is a small den tucked behind the kitchen. Conveniently located first floor washer and dryer. The kitchen is well-equipped with lots of cooking equipment, including steamer for your lobster feast. Our extra-long dining room table seats 12 with ease. In addition, there is a breakfast bar. Ample counter space for group cooking and serving buffet-style meals. 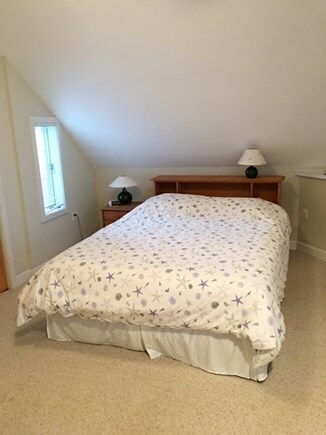 Upstairs has two large bedrooms with queen beds and ample space for a port-a-crib or work area. Good soundproofing for privacy. There is a small deck between the two bedrooms. Full bathroom with tub/shower. 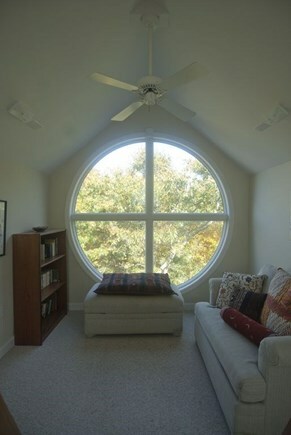 Up another level is a loft with a huge circle window for hanging out, reading, or sleeping. 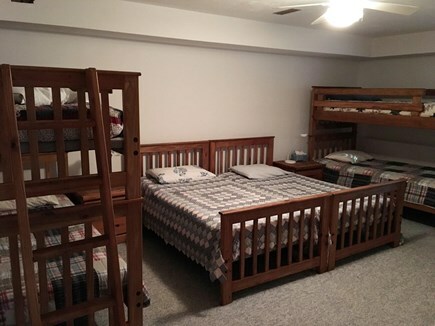 Downstairs to the lower level is a kids' bunk room with two sets of bunk beds and two twin beds (total of 6 single beds). Full bathroom with tub/shower. 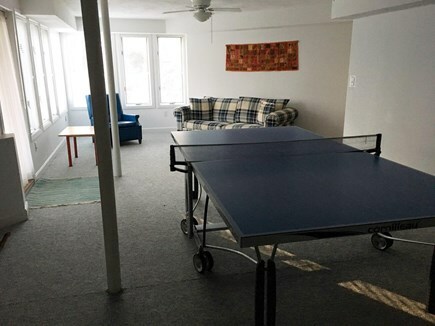 Large playroom across from bunk room with ping-pong table, toys, seating -- lots of windows and walk-out to the back yard with half-basketball court. Our home is in an ideal location - rural up-Island feel, but close to down-Island amenities. Vineyard Haven is a convenient 10 min. drive, with easy access to shops, restaurants, activities, beaches and ferries. Wonderful grocery stores, fish markets, farm stands, restaurants and bakeries are all very close to the house. 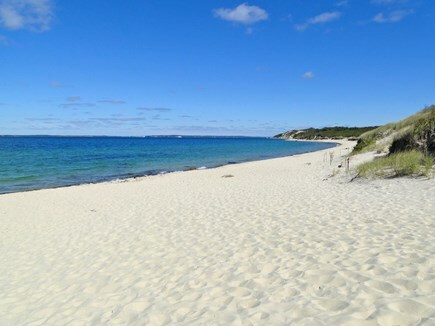 A 5-minute drive to beautiful Lambert's Cove Beach, which is only available to West Tisbury residents and renters and has powder-white sand, calm water perfect for ocean swimming, and stunning views of the Elizabeth Islands. Also close to Seth's Pond, a freshwater swimming spot with great beach for kids. We also enjoy beach days at Long Point Nature Preserve on the south shore, which is great for both body surfing in the ocean waves and swimming in the freshwater pond. For land sports, the town of West Tisbury has public tennis courts and a ball field. The bike path in the State Forest is also nearby. Additional pricing info: Note - There is an additional Cleaning Fee of $360. State and local taxes of 5.7% will apply.